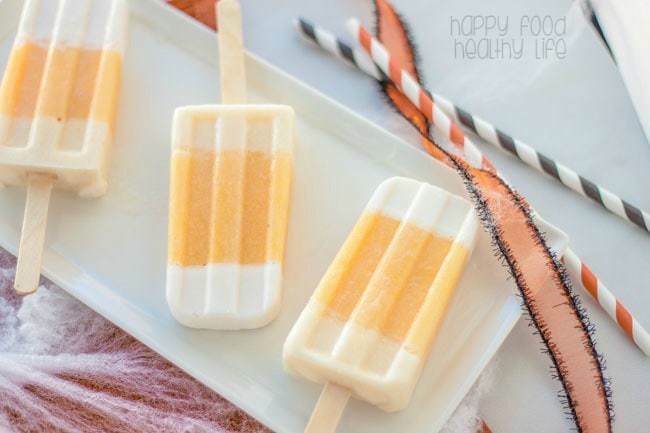 A dye-free, sugar-free alternative to those nasty Halloween candies! 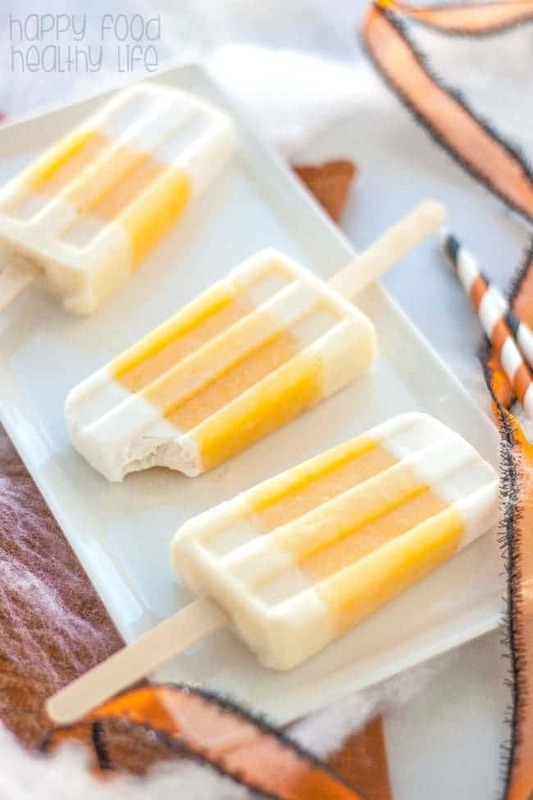 These healthy CANDY CORN FROZEN FRUIT POPS are sure to satisfy your kid’s (or YOUR) sweet tooth! Candy, candy, and more candy! It’s a love/hate relationship, right? There is some candy that I absolutely love. Almond Joys are my #1 candy bar, and I can’t get enough. It’s the first thing I start rummaging for when my son comes back with a bag full of Halloween candy. Thankfully, he’s always kind enough to give me at least a couple. Once Halloween is over, after about a day of me trying to sneak his candy and letting him be a kid and have a few pieces of his own, I’m pretty much over it and ready to throw the entire trick-or-treat bag away while he’s not looking. No, I don’t know what happened to your candy. You ate it all, right?? So one candy that I truly do hate is candy corn. I like it at first. Like the first 5 pieces of waxy sugary corn. But after that, my teeth start to hurt and I regret the fact that I ate any at all and start worrying about the well-being of my digestive system. But when it comes to the kiddo, he just can’t get enough of those tri-colored candies. 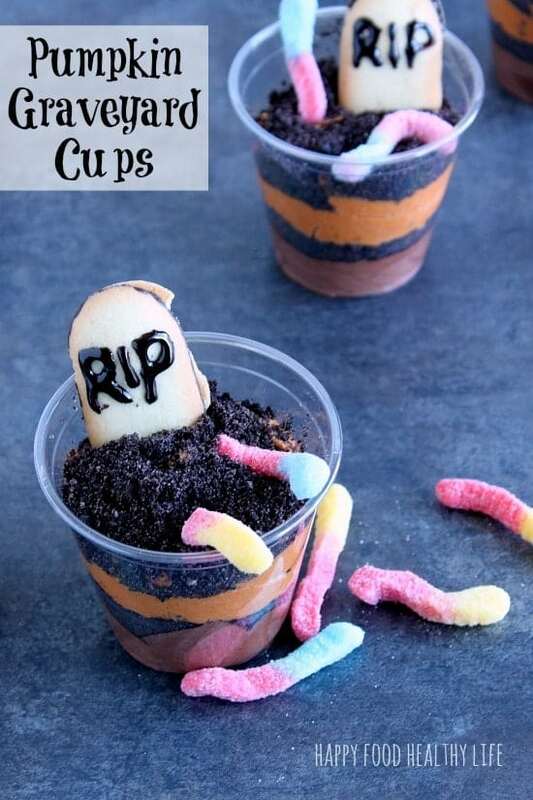 Kids are just so resilient to all the sugar! Thankfully though, my son DOES love one thing more than candy, and that is popsicles. All year long. Even in the dead of winter. 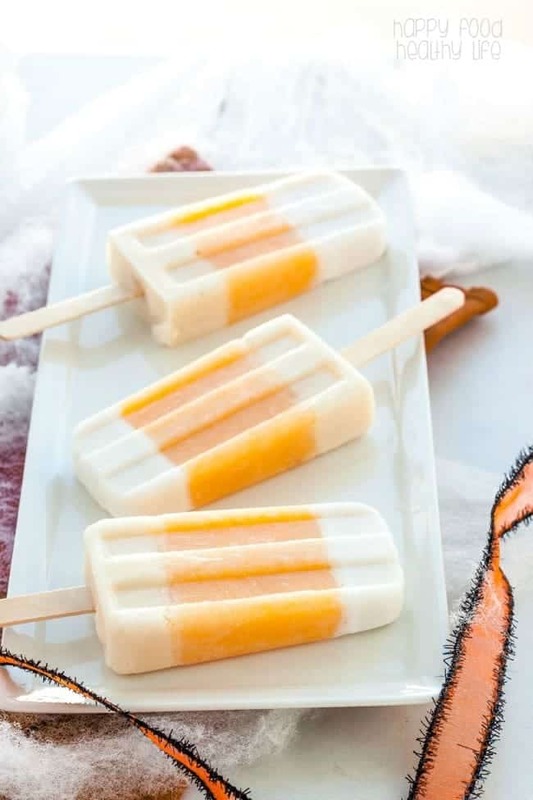 So when I proposed the idea of him getting a festive popsicle that looked just like candy corn, he was over the moon excited. And I was thrilled with the fact that I didn’t have to add any sugar or artificial coloring to make it delicious or appealing. It’s all in the natural sweetener and coloring of the fruit. 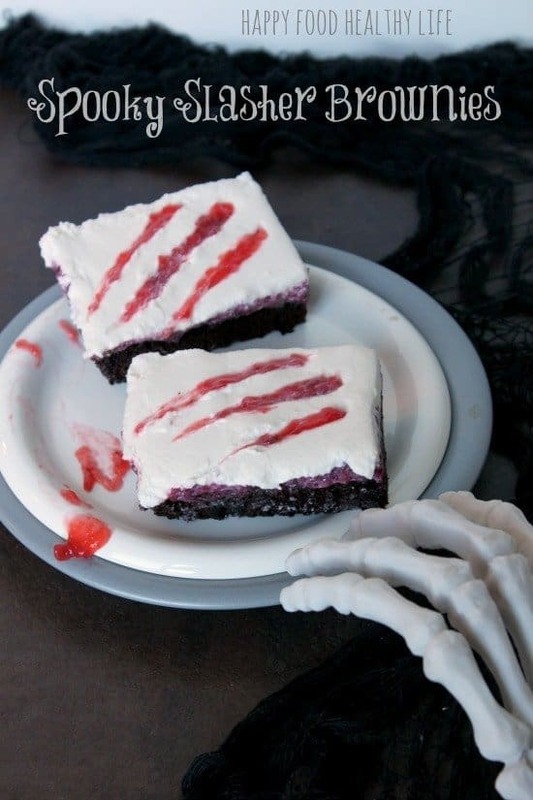 This is one Halloween treat this mama can get behind! 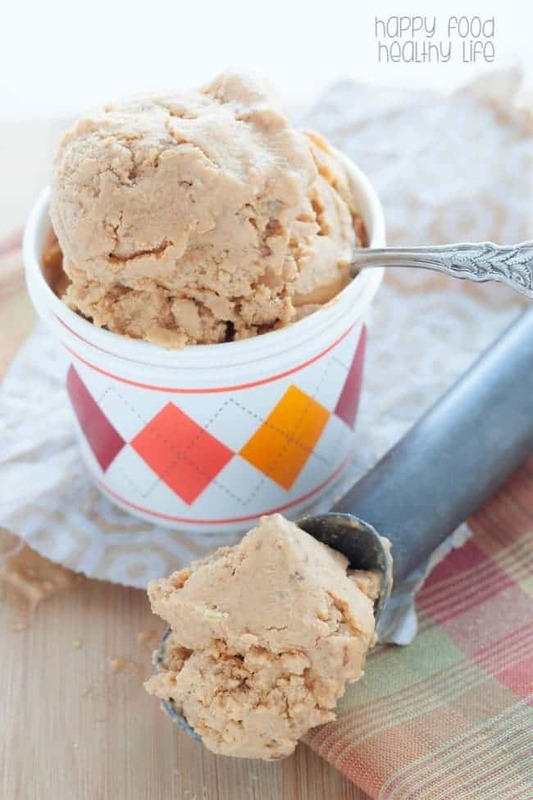 Looking for more festive recipes? 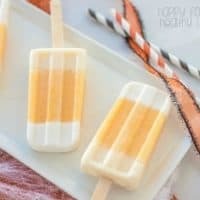 Candy corn without the sugar, artificial dyes, and junk? I’ve got you covered! 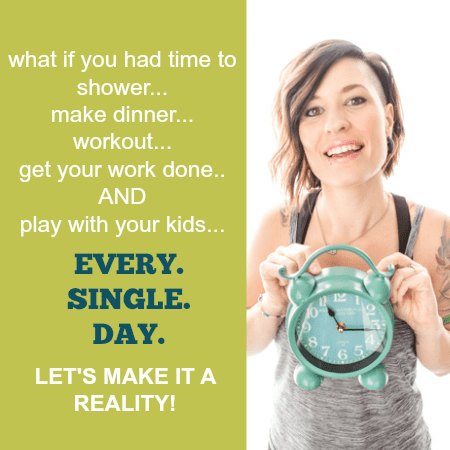 For full instructions, especially for the secret to making those awesome layers, make sure you check out my post on Super Healthy Kids, where I’m sharing the FULL RECIPE this week! Those look and sound fabulous!! thank you so much Ashli!! my son loves them and was thrilled that i said yes to them with no hesitation.